Here’s a neat Spring event coming up the weekend of May 14-16: The Grandfather Mountain Naturalist Weekend, which features programs and guided walks around Grandfather, all included in the price of admission. The programs kick off with a “nocturnal walkabout” led by Grandfather’s chief naturalist on Friday night. Saturday’s programs include birding and nature walks, a black bear workshop, a history feature on the Linn Cove Viaduct and a presentation on growing medicinal herbs. Sunday features a wildflower walk, presentations on birds of prey, the State Parks Program, salamanders and “How to be green without painting yourself”. 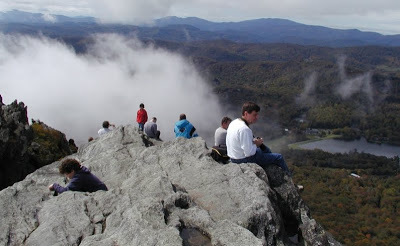 You can view the entire schedule of programs and details at the Grandfather Mountain website. And keep in mind that May is an excellent month for seeing wildflowers and birds in the Grandfather Mountain area and all throughout Western North Carolina. Grandfather Mountain is approximately 45 minutes’ drive from the Inn on Mill Creek along the beautiful Blue Ridge Parkway to Highway 221 (or alternatively, you can take scenic Highway 221 all the way to Grandfather). This entry was posted in Uncategorized and tagged birding, festivals and special events, flora and fauna, outdoors, Spring by Inn on Mill Creek. Bookmark the permalink.